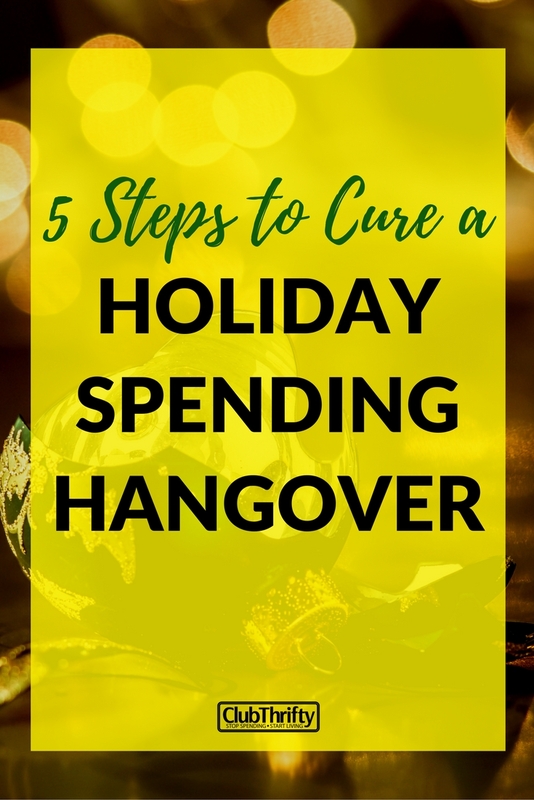 The post 5 Steps for Curing a Holiday Spending Hangover appeared first on Club Thrifty. The holidays are over, a new year is here, but something feels off, doesn’t it? Maybe you took a peek at your checking account. Perhaps you just opened your latest credit card bill. Your stomach is tied in knots, your mind is racing, and your head is suddenly pounding. Yep, you’ve come down with a holiday hangover. Admit it: You’ve been a bit naughty over the holidays. But since you didn’t pay for that Amazon Echo up front, you’re gonna have to pay up now. Don’t worry. This isn’t something without a fix. We’ve got the Bloody Mary for your holiday hangover right here. Let’s get to work cleaning this mess up, then set you up for even more success in the year to come. What do you say? Are you game? Alright, then let’s do this thang! If you spent more on holiday shopping than you intended, you’re not alone. According to the National Retail Federation, the average American planned on spending about $1,000 this holiday season. And since only about 40% of Americans have $500 saved for an emergency, it’s painfully obvious why so many of us struggle with credit card debt. So, if you’re in a less than stellar situation after the holidays, let’s get this thing under control before it spirals into something worse. Here’s how. Alright, you’ve been on a spending binge for the last few months. It probably felt great until you got the bill. Now, comes the painful part: You need to stop spending. Pump the brakes, hit the pause button, and put a halt to spending on things you don’t need. Because your Christmas spirit went off the spending rails, you may have to cut back on a few things you enjoy – at least for a while. Rein in the nights out, meals at restaurants, and entertainment budget until you clean up the holiday cheer. Step #2: Determine the damage. OK, let’s total up the damage inflicted during the holidays. If you haven’t done so already, track your spending for the last few months. Don’t just look at the money you spent on gifts, though. Make sure to include your expenses for travel, holiday parties, and nights out with friends. Most importantly, figure out how much of this you put on credit. This is all stuff you now need to pay back, and you want to do it quickly before that interest starts to pile up! You don’t want $400 in gifts to turn into $500, right? Step #3: Get on a budget. In our book, Zero Down Your Debt, we explain how a budget is the most effective tool for unlocking the power of your paycheck. When used properly, it’s like a magic wand that finds money you didn’t even realize you had. Now that you’ve backed yourself into a bit of a corner, you’re going to need this bad boy more than ever. So, bust out your pencil and paper, start planning your income and expenses for the month, and get back on track. Use this step-by-step guide to budgeting for guidance. Step #4: Create a plan. Once you’re on a budget, you’ll know exactly how much money you have coming and going this month. Now, it’s time to deal with that holiday debt. Create a plan for getting that junk out of your life quickly. Consider using the debt snowball to pay off your debt once and for all. It’s not just a great method for destroying your holiday debt; it’s great for paying it all off! Order your debts from smallest to largest and hammer away at them until they are gone. This step-by-step guide to the debt snowball can help you get started. If it’s going to take you a few months to pay off your credit cards, you might want to consider moving those charges to a balance transfer card with 0% interest. These cards generally allow you to move your balance and pay zero interest from anywhere between 12 and 21 months, depending on the card – although you can’t generally transfer balances within the same company. Balance transfer cards can be a good way to help you get back on track. Use a 0% rate to get ahead and don’t pile on any more debt, and you’ll be back to even in no time. Compare the best balance transfer cards here. A plan is just a plan unless you follow through, right? You’ve got all the tools you need, now you just need to do it. Think of eliminating your holiday spending hangover as the start of a new you. Once you’ve got it all paid off, don’t stop! Keep truckin’! Sticking to a budget and solid money management isn’t just for cleaning up messes. It’s there to help you plan your savings and spending year-round. And if you take care of your money throughout the year, you’ll be in better position to avoid a holiday hangover after next December. Here’s a free chapter of Zero Down Your Debt to help you get started! Dealing with a holiday hangover hurts. Staring at the bills from all of those holiday splurges is painful. But, making a few bad decisions doesn’t have to ruin your whole year. Get on a budget and learn how to use it so this doesn’t happen again. Heck, make it your New Year’s resolution to make the most of the money you earn. You’ve probably got enough money to spend on the things you really want; a budget helps you use it more wisely so you can save on the things you don’t. We hope this piece takes the edge off of that holiday hangover you’ve been experiencing. We know how it feels, and we wish you the best of luck this new year. Stick to that budget so you can make 2018 great!